Patients can struggle with neck pain on a regular basis and never fully know the cause. With a variety of possible causes, the treatment can vary per each patient. In order to provide neck pain treatment, it is important to first understand what typically causes neck pain symptoms and stiffness. Neck stiffness often accompanies neck pain and is one of the main reasons why people seek chiropractic care. The most common cause of a stiff neck is a muscle sprain or a soft tissue sprain, which results in both the stiffness and neck pain. Patients who come in for neck pain treatment will explain that a stiff neck can last from a week to a longer period of time. While a stiff neck can be mildly painful, it can also be annoying since it limits motion, mobility, and ability to simply turn one's head. We can treat stiff necks or other neck pains with the proper chiropractic treatment and ensure that the process runs smoothly. Come into our chiropractor office so that you can get the treatment you need in order to get relief and ensure that you do not end up with a more serious condition. 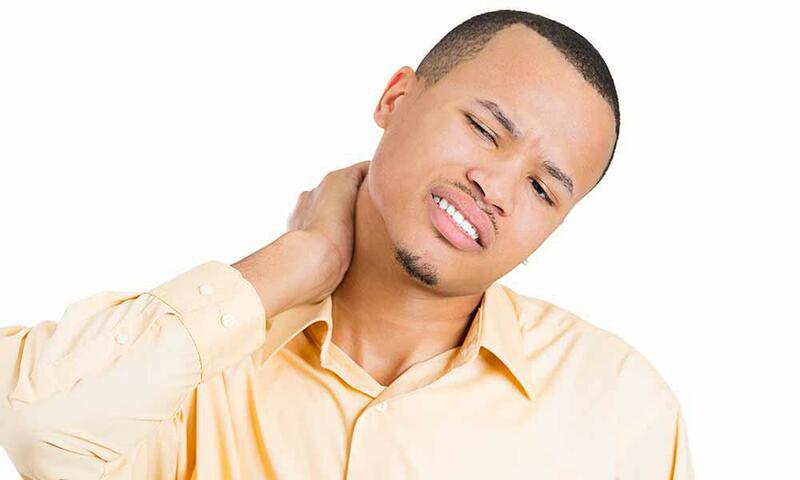 When it comes to neck pain treatment, one of the most common conditions that we treat is the stiffness of the neck caused by a muscle strain or soft tissue sprain. Particularly, the lavatory scapula muscle is susceptible to injury. The levator scapula muscle is located at the back and to the side of the neck; the area where most people tend to rub if they have a stiff neck or neck pain symptoms. If you are one of the millions of people who have sought neck pain treatment by asking a loved one to rub the base of your neck, chances are that you are having stiffness and pain associated with the levator scapula muscle. While the sentiment is nice, you should come in for a chiropractic adjustment. The levator scapula muscle connects the cervical spine, more commonly known as the neck, with the shoulder, and the muscle is controlled by the third and fourth cervical nerves. In other words, if you have had a strain in the lavatory scapular muscles, you may need to get neck pain treatment from your local chiropractor for long-term relief. If you are coming in for neck pain treatment associated with the levator scapula muscle, chances are you have injured it in one of three ways. These are by doing common everyday activities. The ways that you can injure the levator scapula muscle is by the use of a pillow that does not provide the right amount of support and comfort, a sports injury, or by faulty posture and ergonomics using your office chair. Most simplistically explained neck pain treatments are often necessary if you sleep in a way that your neck is in an awkward position. We can strengthen the neck muscles if you have had a sports injury or if you have poor posture such as slouching when looking at a computer monitor. The sports injuries referred to are often caused by repeated motion like turning the head from side to side. We are here to assist you for all of your back and neck pain needs. Call today to schedule your examination.